Overworked true crime magazine editor George Stroud (Ray Milland, The Lost Weekend, The Pyjama Girl Case) has been planning a vacation for months. However, when his boss, the tyrannical media tycoon Earl Janoth (Charles Laughton, Witness for the Prosecution), insists he skips his holiday, Stroud resigns in disgust before embarking on an impromptu drunken night out with his boss's mistress, Pauline York (Rita Johnson, The Major and the Minor). When Janoth kills Pauline in a fit of rage, Stroud finds himself to have been the wrong man, in the wrong place, at the wrong time: his staff have been tasked with finding a suspect with an all too familiar description... Stroud’s very own! 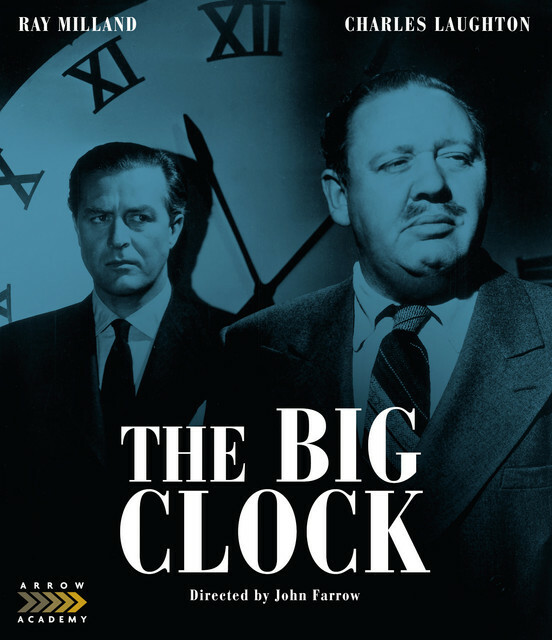 Synopsis: Adapted by acclaimed screenwriter Jonathan Latimer from a novel by the equally renowned crime author Kenneth Fearing, The Big Clock is a superior suspense film which classily combines screwball comedy with heady thrills. Overworked true crime magazine editor George Stroud (Ray Milland, The Lost Weekend, The Pyjama Girl Case) has been planning a vacation for months. However, when his boss, the tyrannical media tycoon Earl Janoth (Charles Laughton, Witness for the Prosecution), insists he skips his hols, Stroud resigns in disgust before embarking on an impromptu drunken night out with his boss's mistress, Pauline York (Rita Johnson, The Major and the Minor). When Janoth kills Pauline in a fit of rage, Stroud finds himself to have been the wrong man, in the wrong place, at the wrong time: his staff have been tasked with finding a suspect with an all too familiar description... Stroud's very own! Directed with panache by John Farrow (Around the World in 80 Days), who stylishly renders the film's towering central set, the Janoth Building, The Big Clock benefits from exuberant performances by Ray Milland and Charles Laughton, who make hay with the script's snappy dialogue. A huge success on its release, it is no wonder this fast-moving noir was remade years later as the Kevin Costner vehicle No Way Out. U.S. STREET DATE: MAY 14. UK STREET DATE: MAY 13. Henry Morgan plays an intimidating, silent enforcer, and the shadowy pursuit through the Art Deco-styled building is visually interesting. The tick-tock-race-against-a-deadline plot engine is well used, like in the remake No Way Out, but Milland comes off a bit drab when surrounded by fascinating actors like Lanchester, Laughton, and George Macready (and even Morgan in his few scenes commands your attention with his unwavering intensity, no matter how much else is populating the frame). The movie also sports a number of Farrow's signature long serpentine takes, Including the opening shot which cheats with an optical when it "goes inside". The substantial homosexual text in the movie is another delicious aspect. Adrian Martin will undoubtedly not gloos over this in his bonus piece.